The platform is equipped with a FACS Aria II (BD Biosciences), a new generation high throughput sorter-analyser. A sample injection chamber with adjustable temperature (4, 20, 37, or 42°C). Agitation of the sample keeping the cells or particles constantly in suspension. A “cell flow” tank with a fixed alignment highly sensitive to fluorescence, improving resolution and the sensitivity of signal detection. Two solid lasers, air-cooled, wavelengths 488-nm and 633-nm, provide the opportunity to detect 12 parameters of which 10 are fluorochromes. The FSC is detected by a photodiode. 4. Several bus sizes are possible (70, 85, 100, and 130 microns) that enable users to sort a large range of particle sizes. Increasing the bus size also makes it possible to sort sensitive cells or particles at a lower pressure. 5. A 4 way sorting device separates 4 cell populations into different types of tubes (2ml, 5ml, or 15ml). 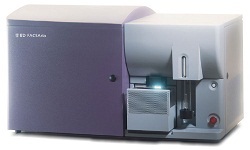 The instrument is also equipped with a cell cloner (ACDU – Automated Cell Deposition Unit) in order to deposit unique events in one of the pots on a plate (24, 96, or 384 pots) or yet again, on a glass slide. The sorting can be carried out under aseptic conditions so that it can be cultured. Sorting speeds of up to 20,000 events/second are possible. The instrument settings, calibration, and data acquisition of the FACS Aria are carried out on a PC station using the FACSDiVa™ (version 6.1.3) software.